I hung my watch directly over my face, in the tent, so there would be no chance of not hearing the alarm. 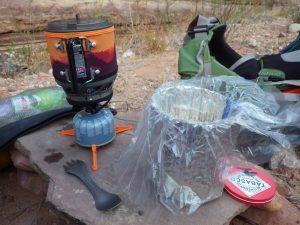 I was up at first light, had my kit packed and chose one of my quicker breakfasts: Alpineaire makes an instant smoothie that mixes with cold water. I brought a few of them to try out on this trip. They’re fast, taste good and are actually good for you. 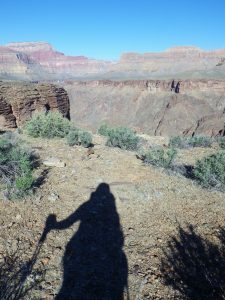 Moving as quietly as I could, I packed up and started hiking at 7:30 – I did not want to wake the Bullroarer or her group and planned on staying ahead of them for the day. 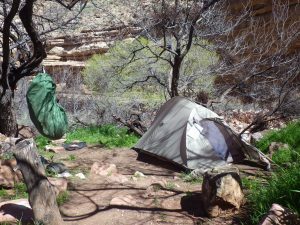 They were just beginning to move around their camp, when I hiked out the ledges above them, leaving Lonetree. 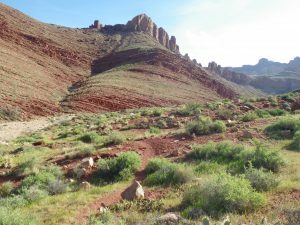 The early start wasn’t a bad thing, the hike over to Grapevine Creek is almost 9 miles, a lot of it shade-free. 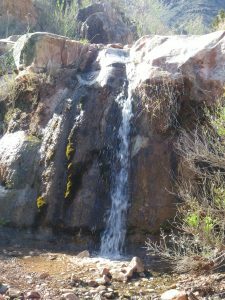 Hiking past Boulder Creek, nice water there this year, I passed a small group heading to Lonetree. 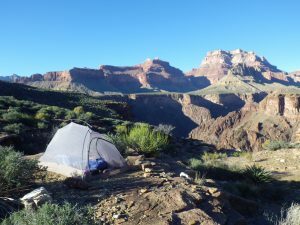 They had camped at Grapevine the previous night and were hiking out the S. Kaibab tomorrow. Soon after, I passed a second group of five, also heading into Lonetree. Lonetree would be a jumping place this evening. Glad I was on my way up-canyon. I had perfect hiking weather – a few wispy clouds and a slight breeze. I pushed on at a pretty good pace and arrived at Grapevine in time for an early lunch/brunch. I love Grapevine Creek. Once you finish heading it out, it goes on FOREVER, you can find nice shade, slick-rock pour-offs, and pools. The campsite arrangement can leave a bit to be desired. 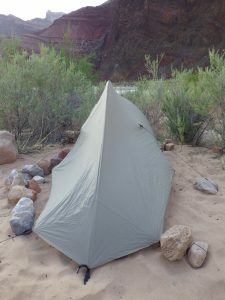 There are three larger established tent areas, with a few smaller ones located close by, upstream. This would be perfect if you were friends with everyone camping there, and you don’t mind potentially noisy groups. I had walked downstream from the trail crossing to find a nice pool to go wading in, and then returned to my pack by the trail to eat and relax in the shade. 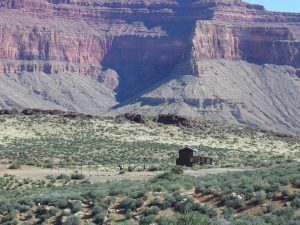 Looking around, I realized that if I stayed here, Bullroarer and her attendees would be right on top of me – the campsites are separated by about 5′ – 10′ of open air and dirt. 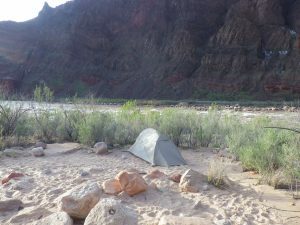 I really don’t mind sharing camping areas, with people that understand the idea of peace and quiet, and I understand the NPS’ desire to minimize human impacts in sensitive areas – riparian zones in the canyon are rare and delicate. 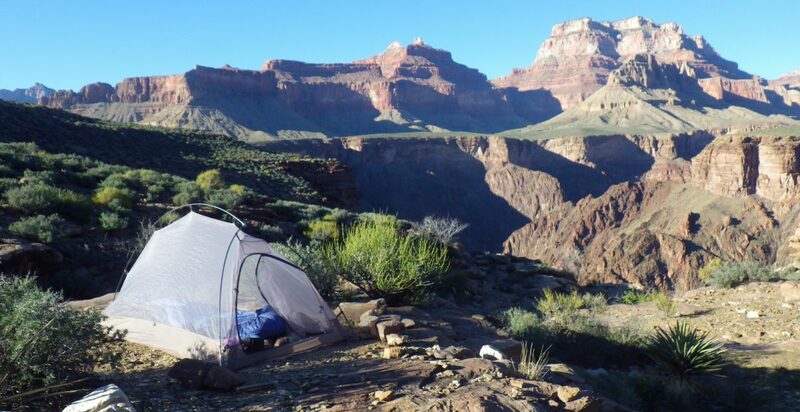 Keeping campsites from expanding all over the place is a necessity. 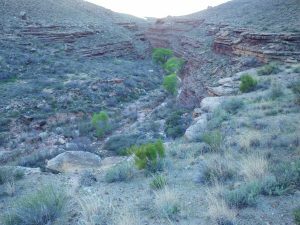 However, after listening to Bullroarer bragging at Lonetree (for my benefit) about how she didn’t care who else was there, I decided to tank up on water, and hike out. 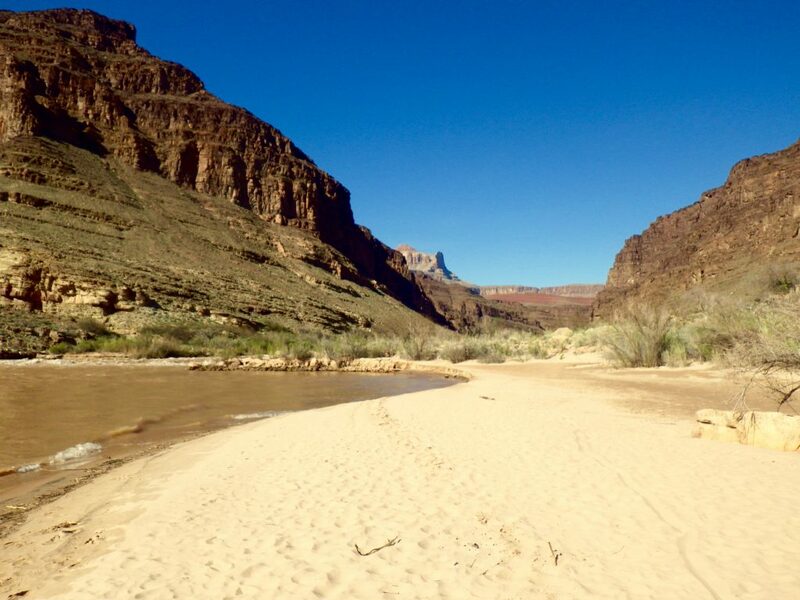 I’ve never managed to spend a night on the Tonto, out on the plateau. But, I’ve wanted to. 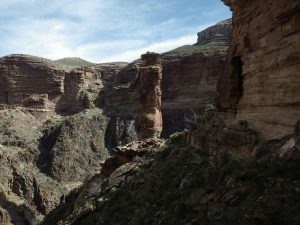 It means carrying extra water for a dry camp, in exchange you have complete solitude and expansive views of the canyon. I hung out at Grapevine for a couple hours, just enjoying the creek and the shade, then loaded up and hiked another two miles, or so. 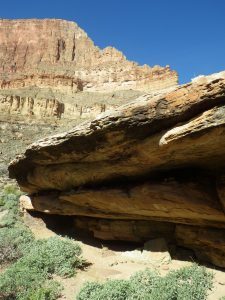 I found a fantastic location below a series of ledges, close to the edge of the Tapeats, complete with nice flat boulders for my kitchen. It was perfect. 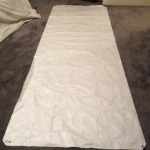 I had a flat slab for my tent, so when I broke camp the next morning there would be no trace that I’d been there. The clouds completely disappeared by dusk, and there wasn’t a trace of wind so I didn’t bother with the rainfly. It was completely silent, with a brilliant star show. I even caught sight of a few meteors. I did have to pull my buff over my eyes when the moon rose. You can read by the moon down there. Up at first light again, out on the plateau first light happens earlier than usual. Not a problem. I was awake anyway. Funny how early I’ll wake up when I go to bed at nightfall… By adding the extra miles yesterday, out to my site on the plateau, I had fewer than 8 miles to cover to Hance Creek – my destination for this evening. 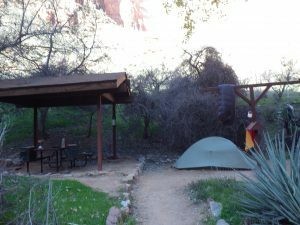 Along the way, I hiked through Cottonwood Creek, another lovely spot – flowing water, ferns, cottonwood trees and some nice campsites. This trip, I would only stop long enough for a quick snack and to dip my toes in the creek. I’ve camped here before, and I’ll be back. 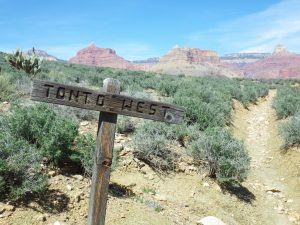 From there, the trail winds out onto the Tonto plateau and passes below Horseshoe Mesa and the climb up to the Grandview Trail. This would be the easiest route out, at this point, if I needed one. I didn’t. 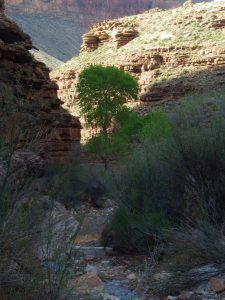 I kept hiking and made it to Hance Creek around noon, and hiked down to the large campsite under the cottonwood trees. There I met Bob and his daughter, from Salt Lake City. 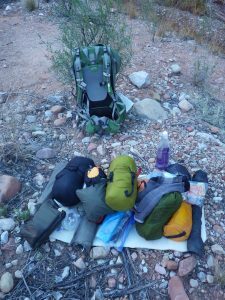 They were on a New Hance to Grandview trip, testing new Hyperlight Mountain Gear backpacks. They invited me to share the shade, and we chatted about our respective trips, work, future trip plans, etc. They were only there for a rest stop and would be tanking up then heading out to find a plateau campsite, as I had done the previous night. 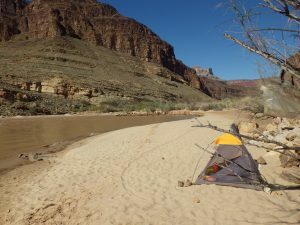 I bid them “Happy Trails” and decided to set my camp up in one of the small, single tent sites a bit upstream. I didn’t want to hog the only large site, in case a group did happen to come in. A couple of guys hiked in from the east and settled into a small site well downstream from me. With the trees for cover and the creek noise, I felt like I had the place to myself. 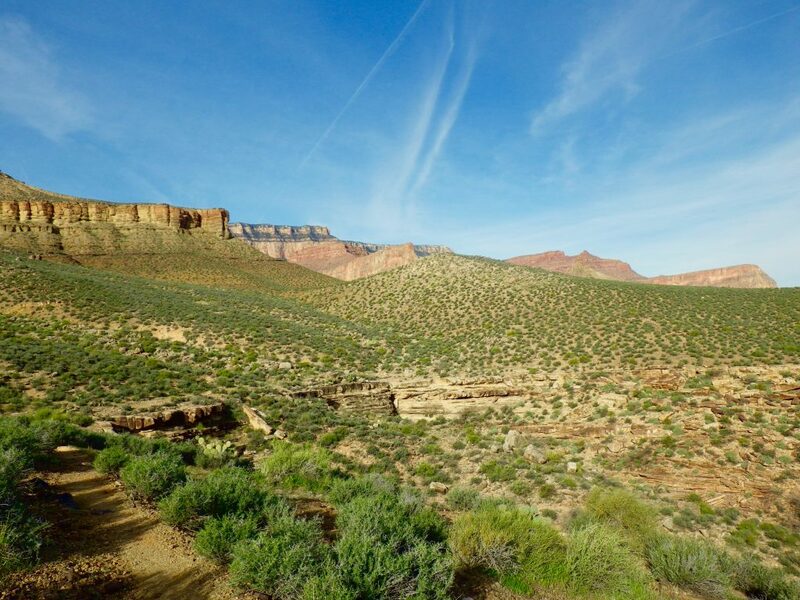 Hance Creek is another of my favorite places in the canyon. There are cottonwood trees, year round water, and the ever-present, nightly peeper chorus. 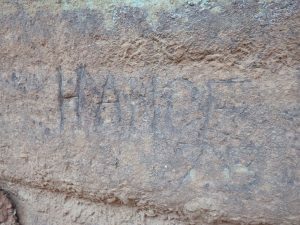 There is a panel of historic inscriptions, just up from where the main trail passes through the drainage, including one from the creeks’ namesake – John Hance. I spent the afternoon relaxing, did some exploring and a little light housekeeping. I try to rinse the dirt and sweat out of my socks every afternoon. My big collapsable bucket comes in handy for this. I have a spare pair to put on, while the ones I wash dry out. It reduces blisters, for one thing. If there is enough water available, I’ll do the same for my hiking shirt. You can avoid (or at least alleviate) heat rash, pack sores, and other problems by practicing a little basic hygiene. 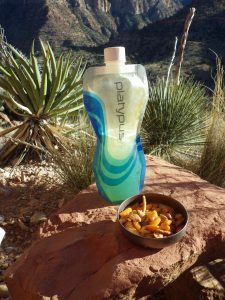 Biodegradable, no rinse soaps are a great way to go, keeping in mind to use them AWAY from the water source. I see no problem wading in creeks or rivers, just don’t rinse soaps, detergents or any other chemicals off in the water source, not even the biodegradable ones. 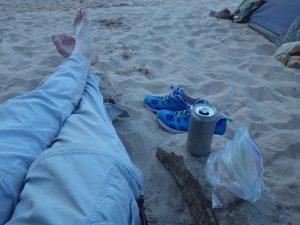 After cleaning up, and dealing with the “warm spot” I’d developed on my big toe, during my speed hike out of Grapevine, I spent a little time drawing in my journal, then was ready for “Happy Hour” consisting of a batch of citrus flavored Cytomax and some spicy snack mix. Dinner soon followed – freeze-dried chicken teriyaki and some dark chocolate squares. I put away the kitchen, hung the Ratsack and waited for the Hance Creek Male Peeper Chorus to begin their concert. The peepers in Hance are the loudest anywhere. It could just be the proximity of the cliff to the creek. It makes for a great echo chamber. Needless to say, I don’t actually fall asleep quickly in Hance. The concert usually doesn’t end until around midnight. 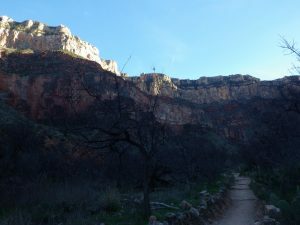 After saying “Happy Trails” to my friend, I turned left at the Hermit Trail/Tonto Trail junction and began the short, easy hike around to Monument Creek. 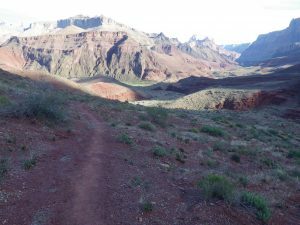 This is another of my favorite Tonto trail sections. Great scenery and the first half is shaded if you get up and leave Hermit early enough in the day. We had a relatively timely start, later than I’d wanted, but not too bad. The night before, I had been awakened around midnight by a small noise and looked up to see a mouse, spread-eagled above my face. He had crawled up the mesh wall of my tent and was peering down at me. I said “Hello” and gave him a gentle thump. 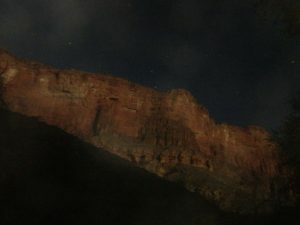 After falling back to sleep, I managed to sleep through the alarm I’d set on my watch, and didn’t wake up until the sun was starting to light up the sides of Hermit Canyon – so much for the early start. It’s a 130′, free-standing spire of Tapeats sandstone that gives the location its name. 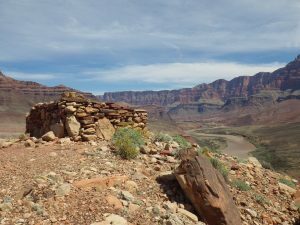 A few short, steep switchbacks bring you into the Monument Creek drainage, past the large group site under the trailside ledges and then past the famous Three-Seater toilet. It’s one of the most scenic, and sociable toilets in the world. 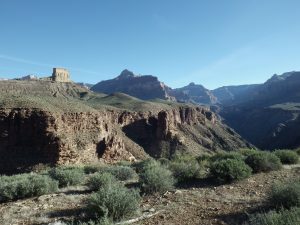 Open to the air, with three seats divided by low privacy walls, it looks up on the Red Wall and is perfectly visible (binoculars help) from The Abyss Overlook, up on the South Rim. I walked into the campground early enough that I had my choice of sites. I chose the last, small site overlooking the creek. It was sheltered in the trees, mostly invisible from the main trail and had its own access trail to the water. 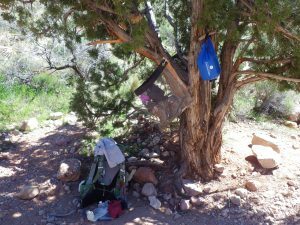 After a quick snack, I hung my food up in my Ratsack and headed downstream to the bedrock pour-offs and pools. The creek was running high and cold. After a quick dunking of your head, you can sprawl on the sun-warmed granite and relax. Monument is another of my favorite places in the canyon, although the last time I was here I was with a group of friends, so was feeling a bit nostalgic/lonely. There is great exploring to be done downstream, lots of birds, lots of shade. 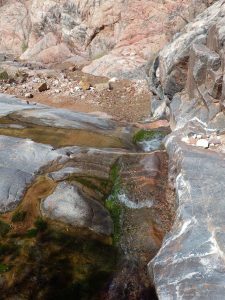 After I’d eaten dinner, and put away the kitchen, I heard a noise down in the creekbed – a short gurgling sound, and the crunching of gravel. I looked over and my trail tired, overfed brain shouted “Oh my god! A condor!” I quickly came to my senses and registered a large wild turkey, picking his way down the creek. Which, at the time made about as much sense as the condor theory. I snapped a couple photos of him. They look alot like the classic “Bigfoot” photos you see online. He did not stand still for me, and the light was terrible but you can make him out. Apparently, it’s not too unusual. 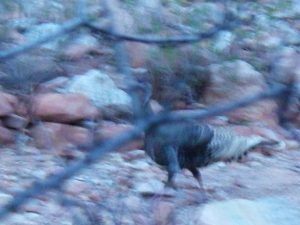 Turkeys do come down below the rim, and sometimes they’ll even winter over at Phantom Ranch. The ranger I ran into the next day was really excited to hear about him. Weird. Despite the two largish groups that came in later in the day, it was pretty quiet in Monument. The creek drowns out most human-caused noises and at dusk, the ever-increasing peeper population began their chorus. 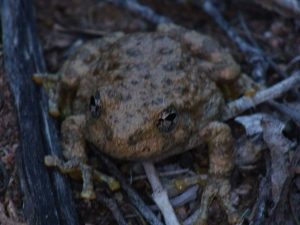 Peepers, if I didn’t mention earlier, are the amorous little frogs that inhabit the Grand Canyon, wherever there is enough water to lay their eggs. They sing a variety of tunes – telephones ringing, goats bleating, doors creaking, small tubas, etc., occasionally a large belching call will emanate from the shadows. When they all join in, it makes for quite a concert. I managed to wake up early the next morning. 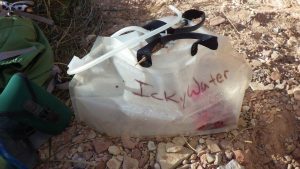 I had a 10.7-mile trek around to Indian Garden ahead of me, where my friend Mike would bring down my resupply bag, and my wife and a couple friends would come down the next day with a pair of clean pants (and a salad)!! 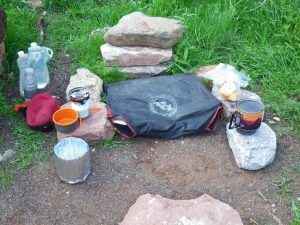 I had two nights at Indian Garden campground, to rest, resupply and rehydrate/calorie up for the next half of my trip. I was looking forward to drinking straight from a faucet, with no filtering/treating required. I Left Monument at 8:10 sharp. 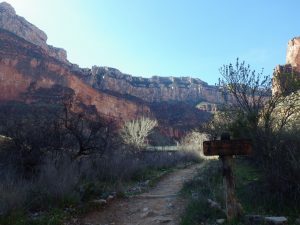 The trick to a pleasant exit from Monument is to start hiking out before the sun has hit the east wall of the canyon. 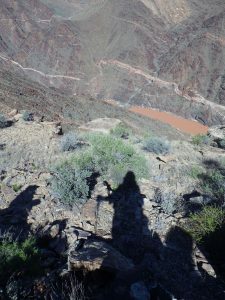 There is a steep set of switchbacks that will take you up and out, and they can be miserable if they’re in full sun. 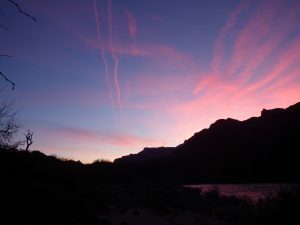 I managed to get through them in 15 minutes, well before the sun hit and was cruising along the Tonto towards Salt Creek. 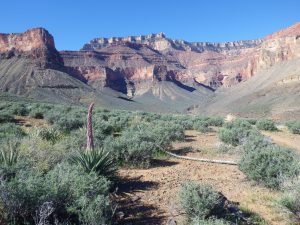 The Tonto contours along, winding through the sage and wild flowers. Again, I meandered off the route a few times, but it was easy enough to regain it. 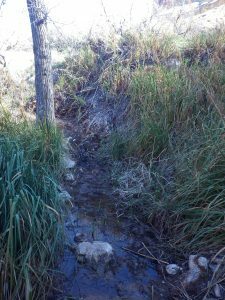 Cedar Spring had water flowing, very lightly, and there was a group camped there. I was really surprised to see Salt Creek flowing, a few gallons a minute. 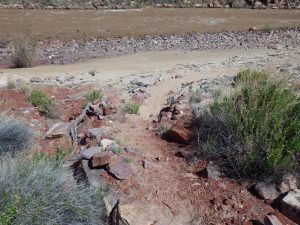 A Backcountry Ranger was hiking out, towards me as I was descending into Salt. She’d spent the night there and was heading for Hermit, with a quick stop at Monument to check some wildlife monitoring equipment. She was very interested in my turkey encounter. After turning down her generous offer for some chocolate, we parted ways and I continued on to Horn Creek. I rounded the corner into Indian Garden at 2 pm, not a bad pace if you add in my lunch stop and other quick rests. 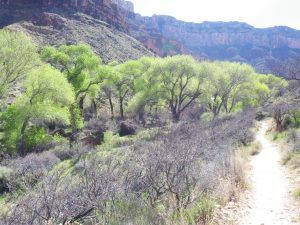 You pass the junction for the trail out to Plateau Point, and then you start to see the cottonwood trees that fill the bottom of Garden Creek canyon. After trudging past the herd of tourists that had walked down from the rim, taking in the array of assorted footwear (some improper), inadequate water containers and watching them try to avoid getting bit by squirrels, while feeding them, in full view of the “Do Not Feed The Squirrels” sign, I turned up the path into the campground. I found Mike sitting at one of the campsite picnic tables, he’d arrived about an hour before. I think he was surprised to see me. I’d originally expected to get into IG around 4 pm. I guess I’d moved faster than I’d thought I would. I owe him a beer (or several). He drove in from Kingman, hiked my 10 lb food bag down, spent the night and turned around a headed back out the next day. His wife was planning on joining him but had to cancel, so he came alone. 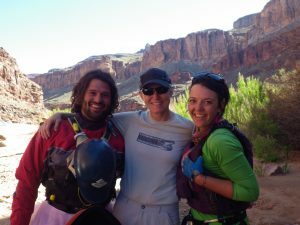 Mike and Gale were the ones responsible for this whole thing – they invited me on a Grandview/New Hance trip in 2011, and with that introduction, I was hooked. I’ve been back every year, since. Mike didn’t just have my pre-packed food cache with him. Gale sent chocolate, and my wife sent an orange, and some Pringles!! Yay, salt! I devoured this stuff right away. 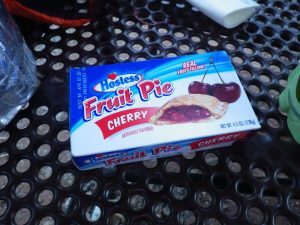 I had packed a Hostess fruit pie in my bag – it made it down, uncrushed and full of fatty, junky, sugary goodness! Perfect dessert after my gourmet meal of Mt House Spaghetti, herbed olives and spicy snack mix. I stayed up past my bedtime, catching up with Mike and playing with the timer setting on my camera. There was a huge packrat running around the perimeter of our campsite, so we made sure to lock up everything in the NPS provided rocket boxes. 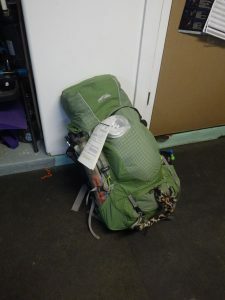 The packs were hung on the steel pack rack, and after my long hike, I crashed. 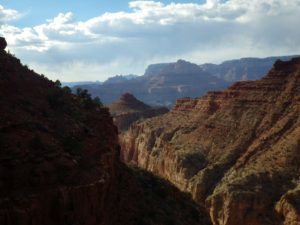 Tomorrow, I would relax, do laundry, lounge and my wife would drop in for lunch (day hiking from the rim). Turquoise to Slate! 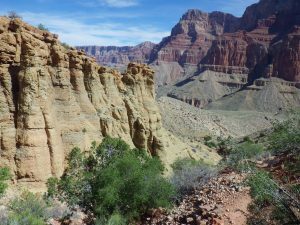 The day included approximately 9.3 miles of Tonto Platform hiking, at it’s best, with a couple large side canyons to head-out – Sapphire and Agate. 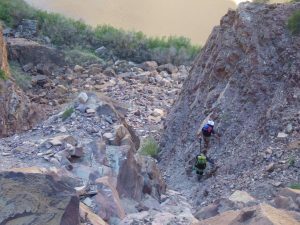 They both had steep descents and exits, but nothing too epic. 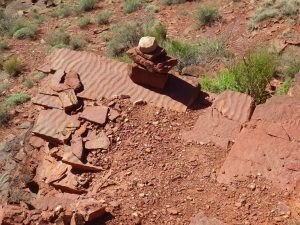 For the most part, the trail was well established and marked with cairns. I only had to meander a few times, after losing it in the sage brush. Before starting out, I decided to switch out my copper Superfeet insoles for the pink Superfeet I had tossed into my pack as an afterthought. I had started to develop a pinched/blistered spot on the side of my heel and really wanted to nip that problem in the bud. It worked! The extra weight of the spare insoles paid off. From that point on, I didn’t have a SINGLE blister or hotspot issue, for the rest of the trip. 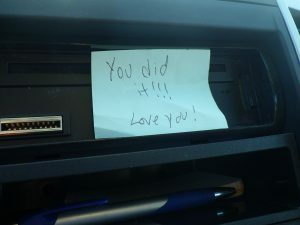 A good thing too, as I managed to lose my little roll of ducktape someplace, along the way. Hopefully, someone really needing a roll of tape stopped in the same shady spot, where I’d lost it. Heading into Sapphire, the trail passes below a fairly large, prehistoric rock shelter complete with a nearby roaster. Contemporary visitors have utilized it as a campsite. 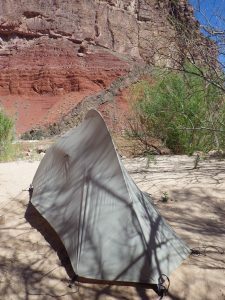 Usually, you don’t want to camp in/on an archaeological site. You can cause quite a bit of disturbance to the site. 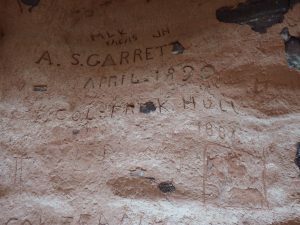 Oddly enough, GCNP actually has at least one designated campsite, smack in the middle of an agave roaster, in the Salt Creek Camp. I guess once a campsite has been “established” by backpackers, the park assume it’s better to keep using it, rather than create new impacts? 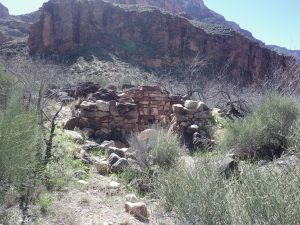 Anyway, the rock shelter was a very nice, example of the site type: a well-extended drip line, sheltered from sun and wind, overlooked a large water source, extensive charcoal/fire-cracked stone deposits and lots of stone-tool waste flakes. 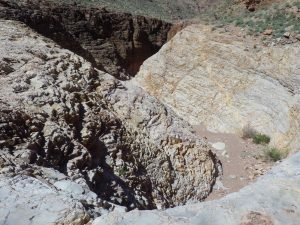 I snapped some photos and then we made the descent into Sapphire Canyon. A short, steep/loose hike down brings you into the drainage. Sapphire is a very nice creek, and was flowing big! 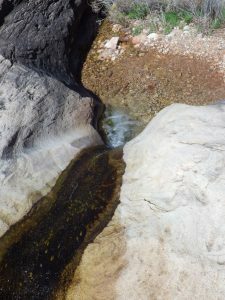 The creek bottom is formed of bedrock in a lot of the drainage, and there are several small pools and pour-offs. It made for a very nice brunch spot. 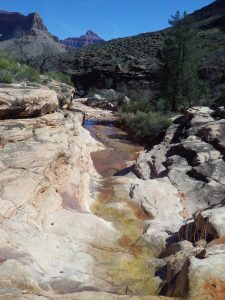 After resting a bit, and letting the feet dry, it was up and out Sapphire and back onto the Tonto, to head out and around to the mouth of Agate. 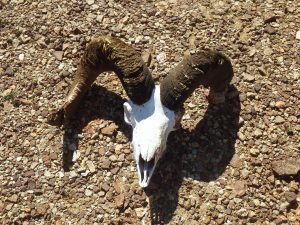 On the way, we came across a bighorn ram’s skull lying alongside the trail. That’s the first one of those I’ve ever found. No sign of any of his skeleton. It looked like it had been there for a season, maybe two. Heading out Agate was a very warm, dry experience. We found no water there (I didn’t expect to) and the trail heading out of that drainage is, as you might guess, loose and steep. 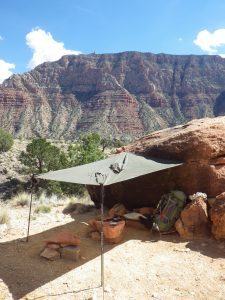 We stopped for lunch in a shady spot, just west of Scylla Butte and then began rounding the point to head into Slate Canyon, our destination for the night. 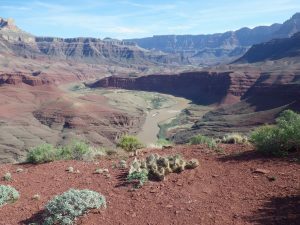 You get some nice views of the river as you turn the corner here and, as always, spectacular up/down canyon panoramas. Dropping into Slate didn’t take too much effort and we were in camp by 4:15. That left plenty of time for relaxing, snacks, doing some laundry, a leisurely dinner. Slate is another beautiful side canyon complete with waterfalls, ferns, very friendly hummingbirds and a huge agave roaster, just uphill from the streambed. 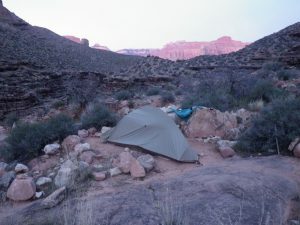 After dining on a meal of Mountain House Biscuits and Gravy (my favorite), and a lovely concert by the local Peeper choir (they seemed to increase in volume at each campsite), I hit my sleeping bag. 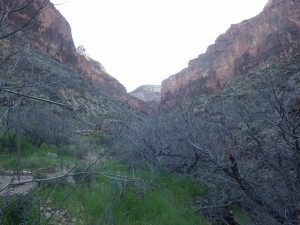 I’d need to rest up for the next leg – Hermit Creek! 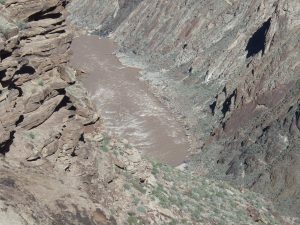 Slate to Hermit Creek is, according to the NPS, approximately 10.8 miles. 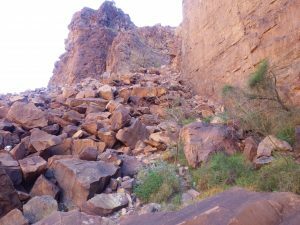 There are several small drainages to head-out and numerous low hills and rises that you ascend and descend. 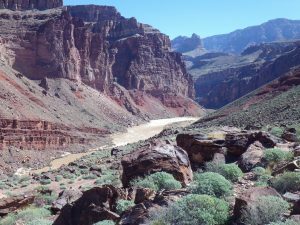 Again, it was a matter of just accepting that you’d “Get there when you get there” and not obsess over “How much further?” The scenery along this stretch is pretty spectacular (it is anywhere in the canyon), and at one point you get to look down onto the notorious Crystal Rapid! Huh, it doesn’t look like much from 1100′ up. The hike around from Slate was all pretty easy and really felt like it went by quickly, until we began our hike around and into Boucher Creek. 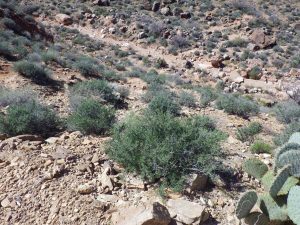 Again, loose and steep descent, and hot – bake-oven hot. I was truly grateful to find a charging, bubbling creek with shady streamside ledges for sitting, and leafy trees. A perfect spot for lunch. The Boucher Trail will take you down to the river, from the rim. It is on my list of routes to do, in winter. It was already too hot for me to imagine taking that project on. 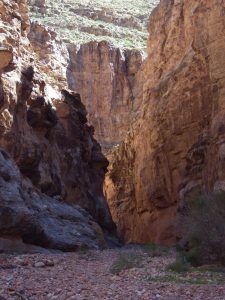 The hike out of Boucher to the eastbound Tonto was very steep, loose and directly exposed to all of the Sun’s loving attention. 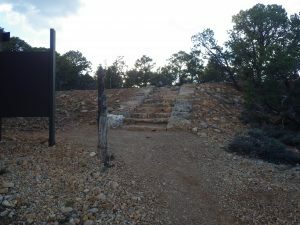 The route out of the creek is marked by cairns, and you hike up to the split in the trail – left Tonto, right Boucher – which is marked by a large cairn. From there the trail contours around Whites Butte to head-out Travertine Canyon. Travertine is dry and fairly easy to get through. Another hour or so, and you drop into Hermit Creek. The creek was flowing so high, I actually had to think about where I was going to cross it without getting soaked. We got to the campground around 4:30, had our pick of campsites and had time to wash up and rinse socks. 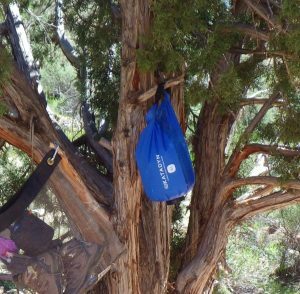 There is a large, steel-pipe pack rack there, to hang your packs on. It helps keep the critters out. The NPS has also replaced the old, open to the universe, portable tank toilet with a nice, new, clean, solar composting toilet. You don’t have to stare at the campers staying in the Group Site when you do your morning business anymore! I’ve heard people talk trash about Hermit, probably because it can be busy, but I love it. Lots of shade, a nice loud stream that will drown out most of the people noise, and more peepers. 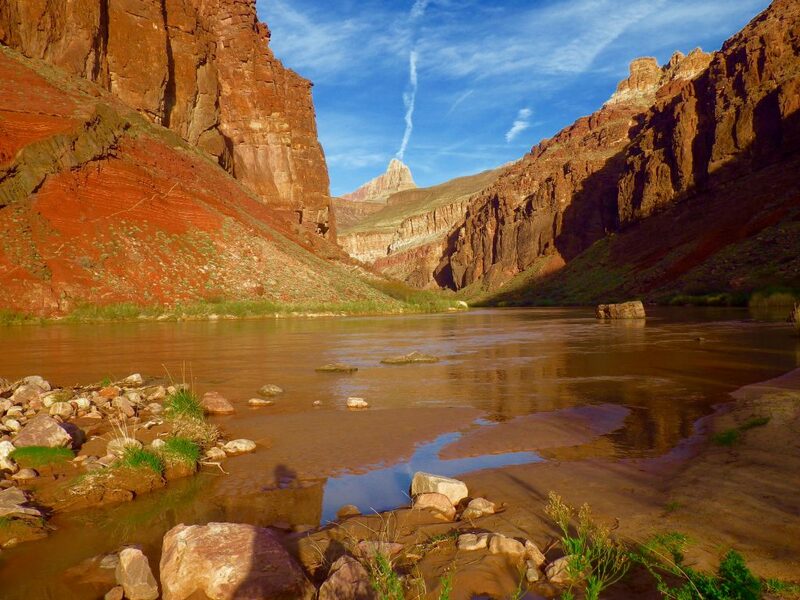 It also makes a nice base to take a stopover day, and hike down to the river, or over to Boucher. We only had one night here. After a dinner of Mountain House chicken and noodles (very tasty) and a nice electrolyte beverage, we called it a night. 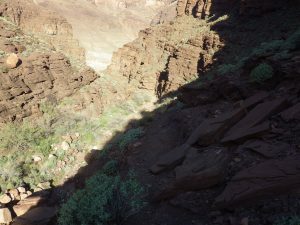 It would be an earlier start tomorrow – my friend was hiking out the Hermit Trail to return to Colorado, and wanted as much shade as possible for the climb. My day would be easy – only 3.5 miles. 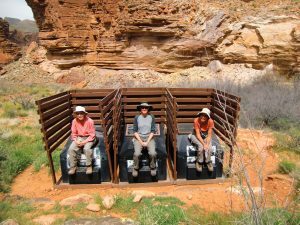 My next stop would be Monument Creek and the famous “Three Seater” toilet!